There’s nothing more satisfying than finding an old, “junky” piece of furniture or decorative item, and turning it into something new and useful again! Whether you’re restoring it to its former glory, or freshening it up for the modern world – it’s awesome to not only save money (and space at the landfill) but also end up with something new to decorate your home. A little while back, I posted photos of Robin’s nursery. 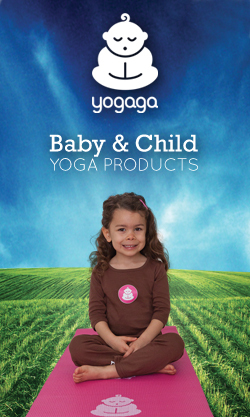 This was shortly before she moved next door to her “big girl” room. Decorating a new room takes both time and money, so I’ve been slowly working away at it and I’m getting close to having it finished. I thought I’d share a few of the DIY projects I’ve done for it, along with a big reveal of the whole room! 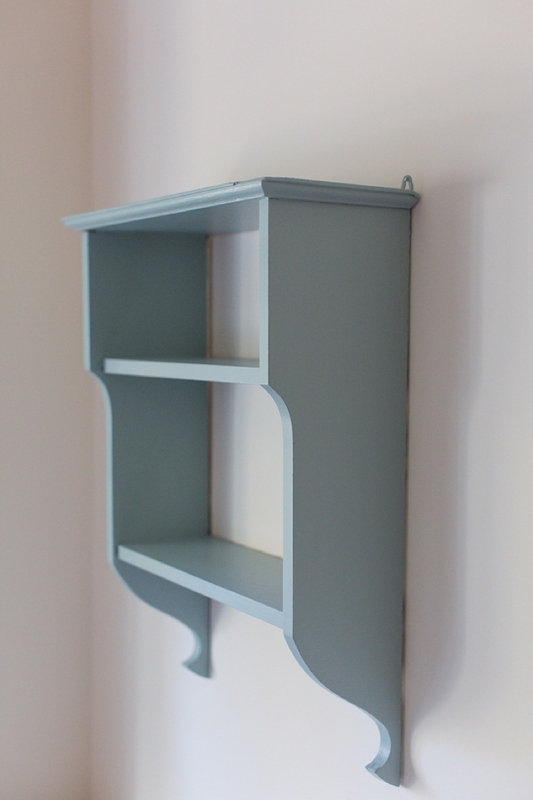 Today, a DIY painted shelf – one of the easiest DIY projects you can do. I found this old wooden shelf while driving in my car a few months ago. I was lost and had to pull into a driveway to turn around, and was delighted when I noticed the old shelf sitting at the end of the lane beside the trash can. 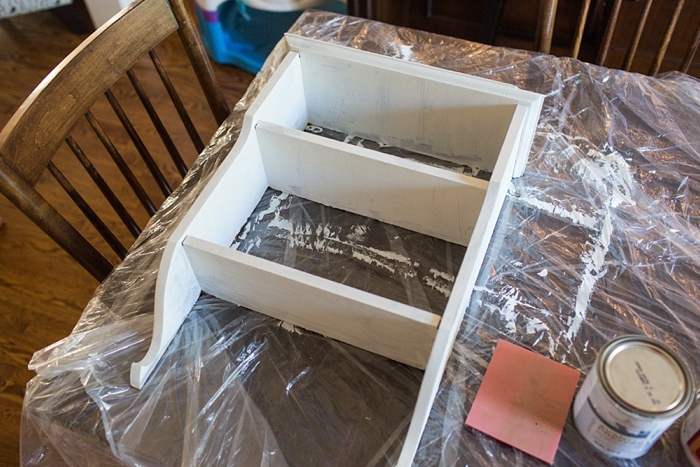 Sanding, primer and two coats of paint later, I had a pretty shelf perfect for Robin’s room. Step 1: Using sandpaper, sand the entire shelf. This helps to “roughen” up the surface so the primer will stick to it. Unfortunately I can’t find the “before” photo, but you will have to trust me that the shelf was brown wood with a shiny finish and very worn-out looking. Step 2: Apply a coat of primer using a paint brush and let dry 3-4 hours. If needed, apply a second coat of primer and let dry 3-4 hours. Step 3: Apply a coat of paint and let dry 3-4 hours. Apply a second coat of paint and let dry. 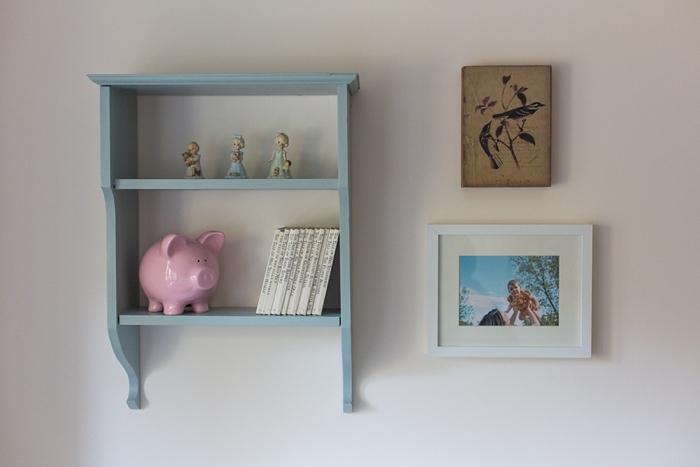 I’m thrilled with the colour and how it looks against Robin’s pale pink walls. Stay tuned for another DIY project from Robin’s new room!